The hydropower industry in Canada will be well-represented with presentations from companies such as Hydro-Quebec, SNC-Lavalin, Hatch and AECOM Tecsult. 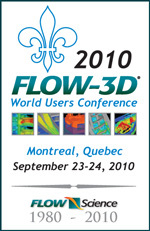 Other topics include offshore structures, the casting of Leonardo da Vinci's famous Il Cavallo and open-cell metallic foams.See a list of speakers for the 2010 FLOW-3D World Users Conference. Stay tuned for a list of poster participants and their topics. This year's conference also marks Flow Science's 30th year of offering solutions in computational fluid dynamics. In honor of Flow Science's anniversary, Dr. C.W. "Tony" Hirt, the founder of Flow Science and a continuing contributor to the development of FLOW-3D will deliver the keynote address titled, "Footprints on the Path to Flow Science." Hotel Deadline - August 26! The official hotel for this conference is the H?tel Omni Mont-Royal in Montreal , Quebec . We have negotiated a room rate of $159 CAD (plus hotel taxes). You can book your room directly through the hotel with the FLOW-3D group rate in place. The hotel booking deadline is August 26. An opening reception will be held in the Automne Room in the Hotel Omni Mont-Royal on Wednesday, September 22. The reception will begin at 6:00 pm and appetizers and drinks will be served. On Thursday evening, all conference attendees and their guests are invited to the conference dinner. The dinner will start at 7:00 pm, at Andiamo. The conference dinner is sponsored by CEI. FLOW-3D training sessions will be held September 22, the day before the users conference. Conference attendees can attend any or both of the training sessions. Lunch is included with training. Attendees can sign up for training when registering for the users conference. A FLOW-3D training credit can be used to attend BOTH sessions.